Since I wrote on the president’s media chat two weeks ago, many things have happened. 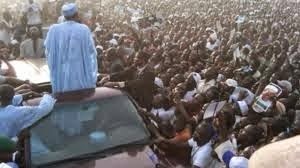 We saw on live television, our first lady inciting her husband’s supporters to stone those who are chanting ‘change’. She likened those calling for change to bus conductors and said that PDP members are not bus conductors. We have been treated to more death wish tantrums from Femi Fani-Kayode and Governor Fayose of Ekiti State. General Buhari spoke at Chatham House, where a rented crowd of hecklers awaited him as well as a crowd of his supporters. Buhari gave his lengthy speech standing despite Fayose’s insistence that he was lying ill in hospital as part of his wishes on Buhari. Sahara Reporters was able to find out that the professional protesters were all loaded onto a bus from Manchester to London for the job. A rumoured amount of $20,000 was earmarked for the whole show of shame. We have also seen many successes reported from the troubled areas of North East. The men of the armed forces have suddenly become good again. Just after Jega was forced to postpone elections and just when it became clear that the issue most people scored Jonathan low on was insecurity, the president began to act. He started wearing the uniform of a commander in chief. He started visiting the places he once said were too dangerous because “Boko Haram will just shoot at us”. It became quite evident that a lot of politicking was responsible for the lacklustre performance of our gallant men and women of the army and air force in the past. A superficial look at these successes would suppose the victories are a plus for the president but this could not be farther from the truth. On deep introspection, you would wonder why only after the 6-week delay in the elections did our men start performing. You would wonder whom the president and those who sat on the resources required to fight the enemy were trying to fool. You would imagine what could have been if these people were honest and serious with the fight against Boko Haram ab initio. He started making surprise visits to the displaced and dispossessed and we begin to see unprecedented spending on projects for the youth, Nollywood and the music industry as well as pensioners- people he largely ignored before the postponement. So many thoughts would run through your mind and the only explanation that makes sense is that someone is seeing imminent defeat at the polls, which will be conducted by a chairman that cannot be bought and decided to buy time to try and fix all what he deliberately left undone before. I believe Nigerians have gone beyond that. You cannot do in six weeks what you left undone for six years. The picture is getting clearer on the issue of removing Attahiru Jega as the INEC chairperson too. The Senate summoned Jega to give account of INEC’s preparedness for the elections and he did. There was a flurry of questions on the same issue of permanent voter cards (PVCs) and the electronic card reader. Any keen observer would note that the particular senators that the Senate President, David Mark called to talk were those close to the president and who opposed the use of the card reader. At one point, Mark called on two senators from Bayelsa in succession. After all the grilling, Jega gave a good account of himself and his Commission. There was a motion by George Akume of Benue state to invite the service chiefs to explain why they could not protect Nigerians during the elections as originally scheduled. That has not happened so far. The impression you get is that the president and his men are averse to anything that would improve the quality of the voting process. How else does anyone explain why anybody would oppose the use of a machine that would eliminate impersonation, multiple voting and multiple registrations? Why is there a consistent noise about using temporary voter cards (TVCs) in place of PVCs when we know any half-wit can produce the TVC from a cheap printer in no time? The answer is obvious: if you can stop the INEC from using a system that will verify ownership of each card, then you can clone PVCs or TVCs and do the usual rigging. Ekitigate also shed light on why the ruling party and the president have been insisting on using soldiers for elections as against all known international standards for conducting free and fair elections. The denials and twists in the tale are enough to tell any intelligent person that there is some truth in that audio recording. At first, Fayose denied being in the audio and said that voice altering software was used to mimic his voice. Then he later admitted that he was in the audio but that he was merely trying to prevent the army from rigging the election in Ekiti state in favour of the APC candidate. Musiliu Obanikoro who was very prominent in the audio recording also similarly denied any involvement and later said something similar to what Fayose said. Our President said it is a fabrication and dismissed it. The army has not thought it wise to investigate the very serious crimes against the state that that audio recording captured for posterity. In two weeks, many awful things have happened but that is not what I want to write about. I want to continue with my assessment of the presidential media chat but there have been many distractions. Distractions I could barely ignore. One of the serious questions the president was asked was why he kept going from one church to another during his campaigns. He said the churches were the ones inviting him. He said the Muslims have not been inviting him to their mosques and that was why he has not been seen in Muslim gatherings. The president’s claims are not entirely true. Firstly, he went to churches on his own. When he went to Pastor Enoch Adeboye’s church, he was not invited, the same for Bishop Oyedepo’s church. Oyedepo said in the video of the president’s visit to his church that he had no idea that the President was coming. In short, it was impromptu. He also travelled with a retinue of senior Christian leaders, including Pastor Ayo Oritsejafor, the CAN President, to Israel for them to pray for his victory at the polls and to pray for Nigeria. There were also serving ministers and a few governors on that jamboree at the nation’s expense. Secondly, the Muslims have often invited the president but he always sends a representative. He did not visit Muslim groups until he was vying for the position of president again. We have heard about 12billion naira bribe for certain ‘mallams’ to cajole their flocks to support the president. If true, this is the worst thing that has happened to the nation. The newspapers have been awash with stories of another 7 billion naira to CAN members as part of the bribing spree. There has been no serious denial of these weighty accusations. As many commentators have pointed out, the current president has been the most divisive president this country has had the misfortune of having. He routinely uses religion as a political tool. He goes into churches and uses their pulpits to spew forth accusations and complaints. He issues policy statements from the altars and his vice is no better. Namadi Sambo was caught on video telling people not to vote for Buhari and Osinbajo because PDP was more Muslim than APC and that Osinbajo has 5000 churches he controls. He urged the largely Muslim crowd not to vote for a Christian party like APC. He claimed to be a good Muslim and that Namadi, his name, was short for Namadina (meaning belonging to Madinah, the city of the Prophet of Islam). He proceeded to recite Suratul Faatihah to prove his bona fide. Allah is the Greatest! “The Medinite” could not read the seven verses correctly. I became alarmed when the president answered the question on corruption and his quoted statement that, “Stealing is not corruption”. His answer has become the stuff of inglorious legend. He defended his statement and went on to draw parallels between corruption, goats, and yams. He succeeded in convincing hitherto sceptics that he has no serious plans to tackle corruption, the greatest source of the waste of our money and other resources. To answer your question Mr President, Nwobodo could not account for $5.1 million and that is a lot of money. In fact, contrary to what you said, that amount would buy you over 400 Peugeot 504 cars back then. In today’s dollars, when you adjust for inflation, that is $11,471,662.18. Let us approximate that to $11 million. In today’s naira, that is about 2.4 billion naira. You can still buy 400 of the latest Peugeot 508 cars with that money sir! Perhaps why this amount looks insignificant to His Excellency is because the new corruption figures under his watch are in the trillions. The daily oil theft that the president appointed the criminals from his region to prevent has almost reached the same as the daily oil sales. Almost half of what Nigeria produces in a day gets missing. Yet Tompolo and Asari Dokubo have been given multibillion naira contracts to protect the oil. These are aside what gets frittered away by the officials running the state oil corporation and our petroleum Ministry. You read about 10 billion naira spent yearly on private jet charters. The figures are simply overwhelming. We are watching, the world is watching but above all else, Allah is watching and He is swift in reckoning and firm in retribution. Between President Jonathan and wife, I don't I don't know who could win the Oscar for the goofer of the century. They are always bungling things as they rumble along. It is crazy, absolutely crazy for his PDP to ever think they could win the hearts of the North Easterners with the military victories their soldiers have decided to start recording right now. How on earth would they be certain that things shall not relapse after the elections? How can you trust someone who callously played games with your life for six years and then suddenly comes to embrace and promise to make it up in six weeks? How could the North East ever be fenced off from the larger north?